Steve Dresler of Sierra Nevada Brewing Company claims that, on average, it takes five litres of water to make one litre of beer. As an ingredient some of that water will make it into the finished beer, but much is also lost to hop and grain absorption, boil off and vessel dead space. As a resource, water is use to crash cool boiling wort, chill fermenting beer and clean equipment and packaging. Brewing is an incredibly resource hungry process when it comes to water; something that hasn’t been lost on the team at Sierra Nevada. Steve is the head brewer at Sierra Nevada and was recently interviewed by the guys over at The Brewing Network. Whilst I’ve been a fan of Sierra Nevada beers for quite some time, I’ve been completely unaware of the work they’re doing in the field of eco-friendly brewing. Listening to him talk about the goals they have and the plans they’ve already put in place, it totally renewed my respect for the company. Take water for example. The amount of water the brewery consumes per unit of beer has been halved over the industry average. Installing a water treatment plant on site has enabled the burden to be taken off the municipal water supply, enabling in-house reprocessing and purification of all water. This water then cleans the trucks and irrigates the hop yard, the methane by-product of the purification process being fed to the hungry burners that fire the copper. Incredible. 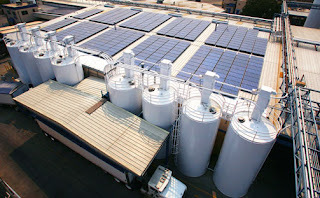 If it’s flat and pointing towards the sky, Sierra Nevada will put a solar panel on it, chances are they already have! Proud owners of one of the largest solar panel arrays in the United States, they’re able to generate 85 per cent of all the power they consume. True, the panels will return on investment within seven years and the government provide grants to businesses setting them up, but you can’t help but believe Dresler when he says the diving force is “doing the right thing”. CO2 reclamation, a private health clinic for staff, supporting small hop growers, a private rail spur to cut down on traffic. I could go on and on about the things that are being done but you can already read more about them here and listen to more about them here. Sierra Nevada are able to do these things in part because of their size, clearly it wouldn’t be possible for smaller breweries to invest such money in decreasing their negative environmental impact. Equally, large organisations paying lip service to the green brigade are all too common place. It’s refreshing to see a business that genuinely cares about their product and about the impact they have on the world around them. WOW, check out those solar panels! generating 85% of the power they consume is awesome. Looks like they have some amazing Eco methods. interesting stuff. Brewers really do have to wake up to the intensity of thier craft on the environment - but like you say, it's hard to do on economies of scale. Take a look at Adnams - they've put some really good initiatives in thier brewhouse in the last few years. And don't Brooklyn harness wind power as well, now? Interesting about Brooklyn, I'm not sure about the stuff they do. It's great that there are companies out there that really do care about the damage they're doing and the resources they consume. Whilst it might be impossible for smaller breweries to do quite as much, every little helps I guess.